nice What size are those 205/40? That looks cool dude! i really like it, congrats! I really like them too. Though if I ever get the chance I would probably get a Cooper D hood and shave the badge. But they will then. Sweet! Can't wait to see them on 'em! I can't wait ether. But I have 2 problems what paint chip to tell the painter to use. I went to the auto paint store and couldn't find a gold that looked right. Then what tires to get. ps. 100th post woot as they say. nice!! another brg/black... if you are going with dark wheels, black out your beltline... that would look awesome. Thanks!!! My wheels are going to be paint the same gold as the Spun Supermesh's keeping a polished lip. But you are right if my street wheels were all black then I would black out the belt line. I kind of the like the chrome belt line becuase it seperates and pops the colors. Kind of like the white pins on the bonnet strips. My wheels they be done!!! 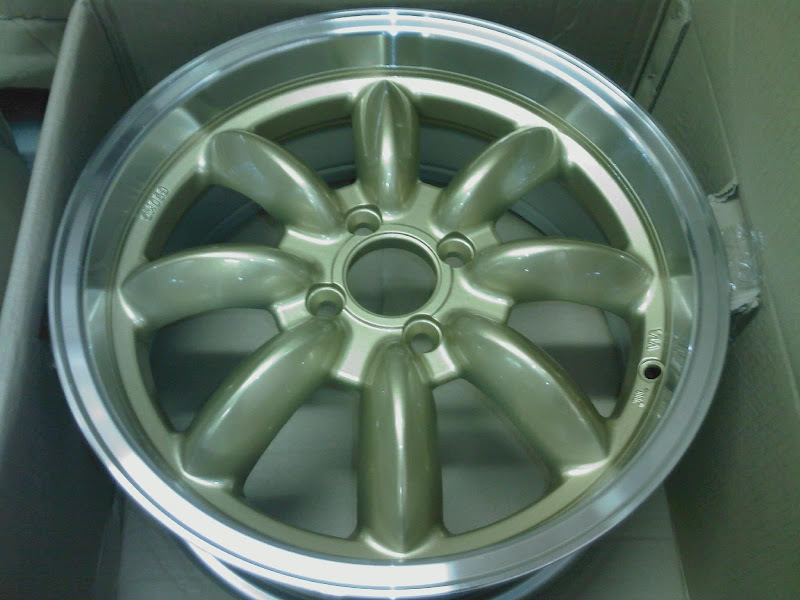 My painter just sent me this phone pic of my rims. Now the only problem I am having is picking a tire size. I was thinking 205/45-16. But I don't know.